NYC, 03/22/2019, 7:00PM. Early Music Performed on Period Instruments. 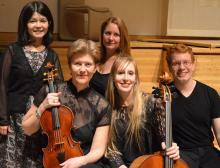 While The Queens Consort performs a wide variety of repertoire spanning many countries and time periods, they have a particular fondness for music of the Venetian baroque. Their instruments are: two baroque violins, baroque viola, harpsichord, baroque cello and two recordes.